Through Their Eyes used the multi-sectoral approach to studying the age friendliness of cities. Thus, understanding the demographics and domains that make up St. Catharines is crucial to this project’s research findings. This page provides a brief breakdown of the city of St. Catharines and the research study site (14 Centre Street, 479 Carlton Street) where the interviews were conducted. For more information about the city, visit the official City of St. Catharines website here. 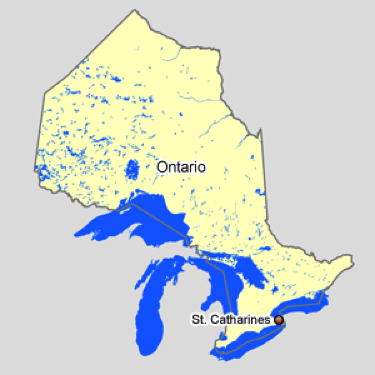 St. Catharines is ideally situated in South Central Ontario as the largest city in the Niagara Region. It is the sixth largest urban area in Ontario and is located 51 km due south of Toronto on the shores of Lake Ontario. A short 19 kilometers away is the Niagara Falls-U.S. border. St. Catharines is nicknamed “the Garden City” because of its one thousand acres of lush parks, colourful gardens and hiking trails. Information retrieved from Air Quality Ontario and St. Catharines Lock Museum. St. Catharines is home to over 131,000 people. The following graph shows the number of residents by age and gender. Approximately half of the population is 45 years of age and over with the majority of the residents aged 45-49 (7.7% or 7060 people). A large amount of the population, almost a third (34% or 44,335 people) are over the age of 55. The next largest group is in the age range of 15-25 where 13% (17,830 people) of the population is in this age range. 23,440 people aged 65 and over live in private residences. 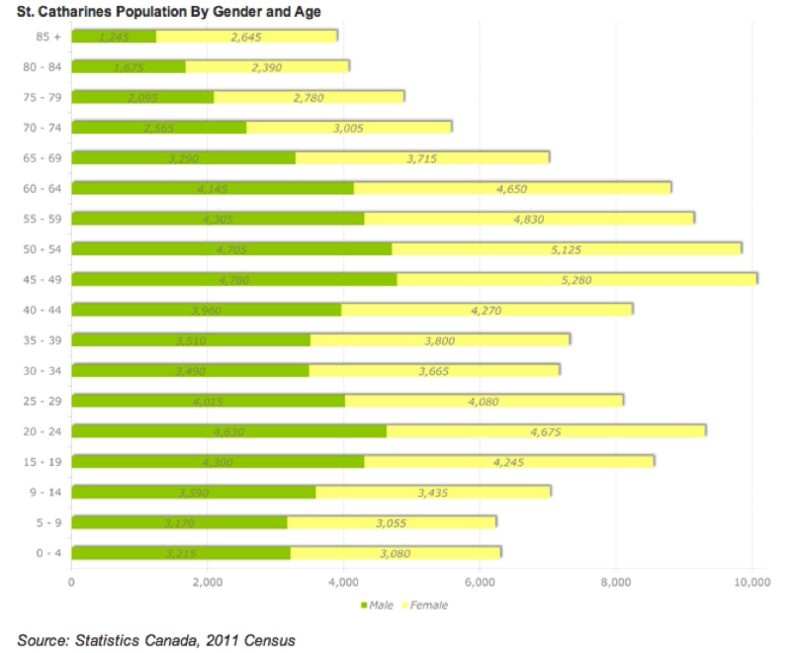 According to the 2006 census, 48% of the population is male and 52% female. Seniors account for 18% of the population and the average age is 41.7 years old. 31% of the population is of English descent, 22% is of Scottish descent and 18% is of Irish descent. Other major heritages include German, French, Italian, Dutch, Polish and Ukrainian. St. Catharines has an extensive public transportation system run by the St. Catharines Transit Commission, with buses that stop in almost all areas of the city, some reaching as far as Thorold. The buses allow for people of all ages and abilities to travel to destinations in the city without driving. Seniors receive a discounted price on a 10-ride card and a monthly pass making it is easier for them to afford travel expenses. All of the main bus routes converge at the downtown bus terminal, just steps away from the seniors residence at 14 Centre Street, making it very accessible to seniors to travel throughout the city. The bus terminal is also served by chartered bus companies like Greyhound and Coach Canada allowing people to make connections for travel to cities like Toronto and New York, among other destinations. St. Catharines has a train station as well located just outside the downtown core. It is served by Via Rail as well as Go Transit and has lines that operate in the summer connecting St. Catharines by train to Toronto. Future plans include a permanent year round Go train service to Toronto. Above (to the left) is a map of the bus and train routes to Toronto and some of the cities they stop at. Due to the city’s location on the QEW/406, one of the most important transportation routes in southern Ontario, and it’s proximity to the U.S. border, St. Catharines is a hub for the manufacturing industry. Among the top is General Motors of Canada and the Wine industry. The job industry is outlined in the table below as it shows the number of employees for certain sectors throughout the city in order of most-to-least employees. 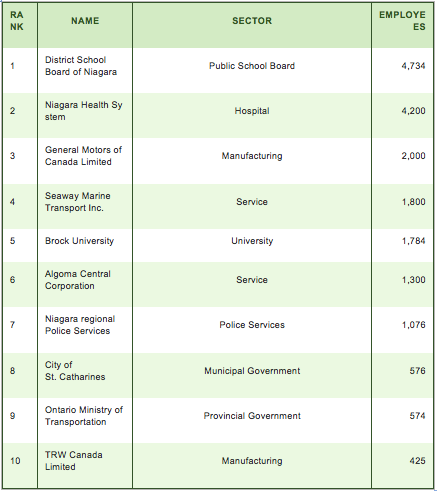 The District School Board of Niagara employs the most people and Niagara Health System employs the second most. Other major employers include General Motors, Brock University and Niagara Regional Police. The nearby town of Niagara-on-the-Lake has 27 wineries. The area has a unique climate and soils which are conducive to growing fruits, especially grapes, which are able to win award-winning wines. St. Catharines itself is home to three wineries: Henry of Pelham Winery, Hernder Estates, and Harvest Estates. There are many festivals to celebrate the success of the Niagara Region’s winemaking such as the Niagara Grape and Wine Festival that occurs in the fall. Since 1964 the city has been home to Brock University. They have a partnership with the Ontario Grape and Wine Industry and is the only university in Ontario to offer a Bachelors degree in Oenology and Viticulture. The university is also partnered with McMaster University’s Michael G. DeGroote School of Medicine and places first year medical students in hospitals in St. Catharines. Niagara College has a campus in the city’s east and Niagara-On-the-Lake and is the only fully licensed teaching winery in Canada. Near the downtown core there is Ridley College, a boarding and day school for boys and girls. The District School Board of Niagara has a total of 119 facilities in St. Catharines including 6 secondary schools. St. Catharines is home to the largest shopping mall in the Niagara Peninsula called “The Pen Centre” and is easily accessible by bus. There is also another mall located in the north end of the city. It is also home to one of the largest farmers markets in Ontario and it operates every Tuesday, Thursday, and Saturday year round. Montebello Park is home to the city’s largest rose collection with over 1300 rose bushes and was created by the same man who created New York City’s Central Park. Brock University also brings a lot of students to the city and the many wineries in the Niagara Region are also popular attractions. Niagara Regional Housing is focused on providing good quality, affordable housing throughout the Niagara Region, including St. Catharines. Affordable housing costs no more than 30% of the gross monthly income of the household. They support people who are physically disabled, people who are HIV positive, people with Acquired Brain Injury and seniors. They own 1,849 senior apartment units.